Pavement Ants – Pesterminate Inc.
Pavement Ants, which usually make their homes in pavements, are small (1/8–1/16-inch long). They are black-brown ants, with paler legs and antennae. The abdomen is all black. They are distinguished by two spines on the back, two nodes on the petiole, and grooves on the head and thorax. The colonies can be moderately large. Swarmers usually appear in June or July; however, they have been reported at other times of the year. In order to properly bait with the recommended ant baits, it is necessary to put the bait out near their colonies or trails. Although you may observe these Pavement Ants trailing during the day, most observation will occur at night. 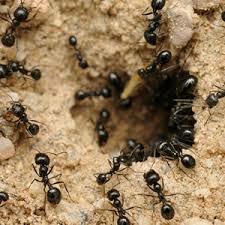 Pavement Ants will displace soil around concrete objects such as sidewalks, patios, driveways, curbs, etc. This displaced loose soil may be seen along the cracks or joints in the sidewalks or driveways. Look for colonies around the foundations of your home and underneath brick patios. Also inspect aroundlogs or large rocks. Inside, look around baseboards, plumbing, sinks, toilets, and along the edges of carpets. They also may be found in the insulation of attics and wall voids.